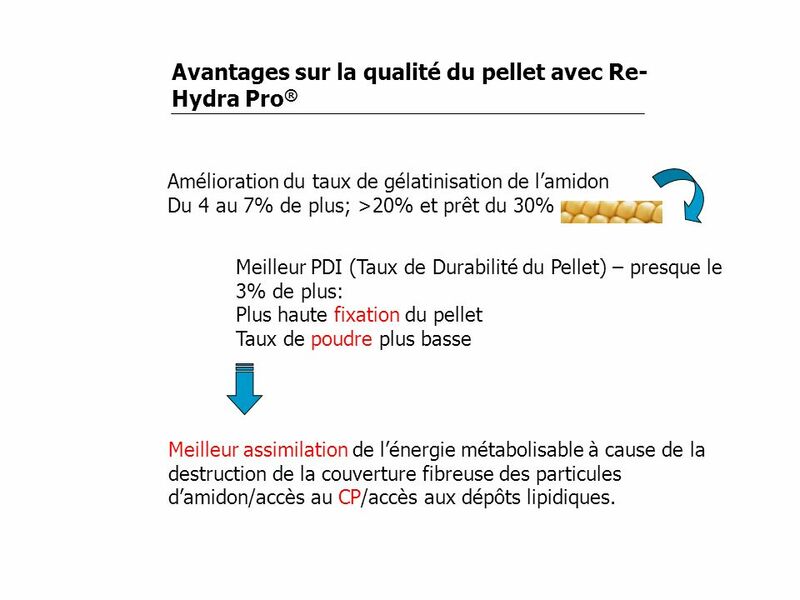 2 Qu’est-ce c’est rehidratation Pellet PLUS+? 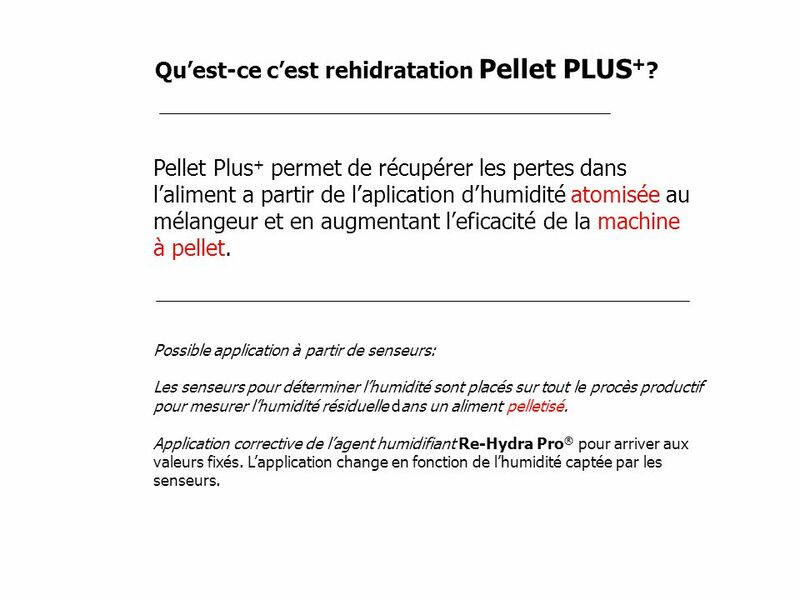 Pellet Plus+ permet de récupérer les pertes dans l’aliment a partir de l’aplication d’humidité atomisée au mélangeur et en augmentant l’eficacité de la machine à pellet. 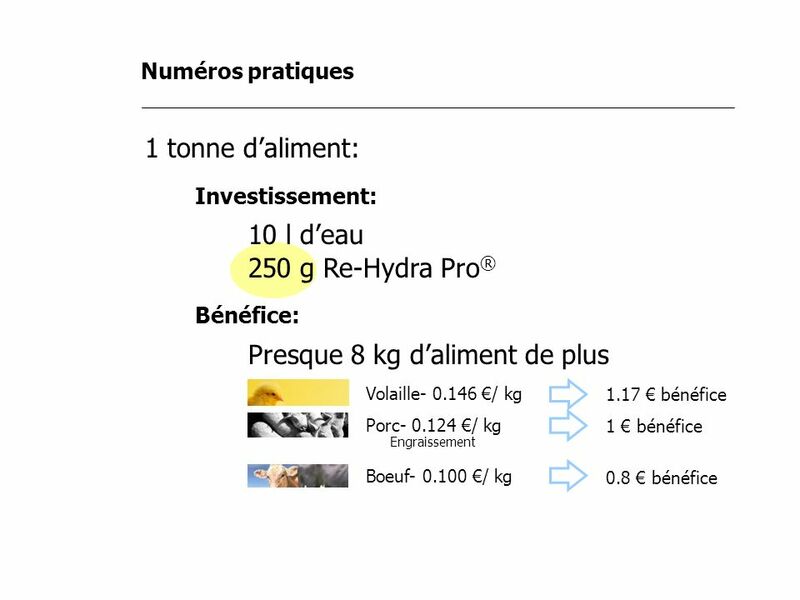 Possible application à partir de senseurs: Les senseurs pour déterminer l’humidité sont placés sur tout le procès productif pour mesurer l’humidité résiduelle dans un aliment pelletisé. 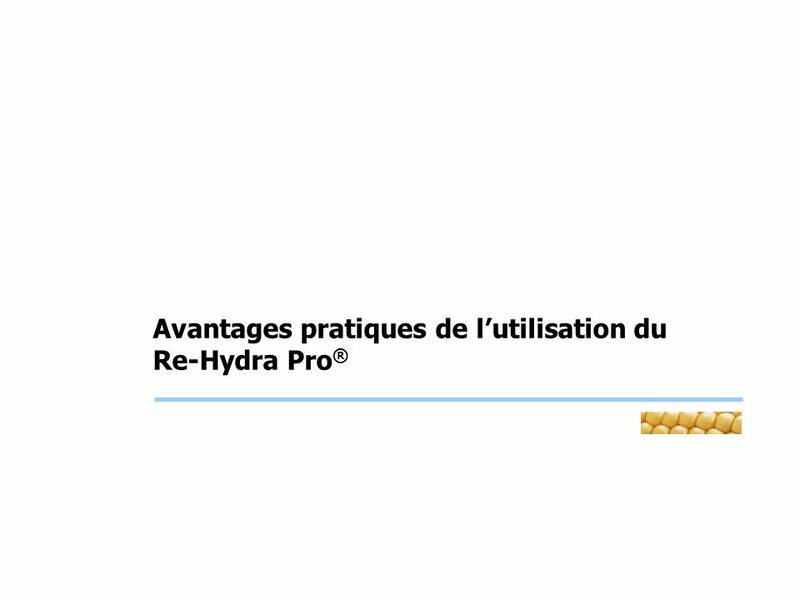 Application corrective de l’agent humidifiant Re-Hydra Pro® pour arriver aux valeurs fixés. 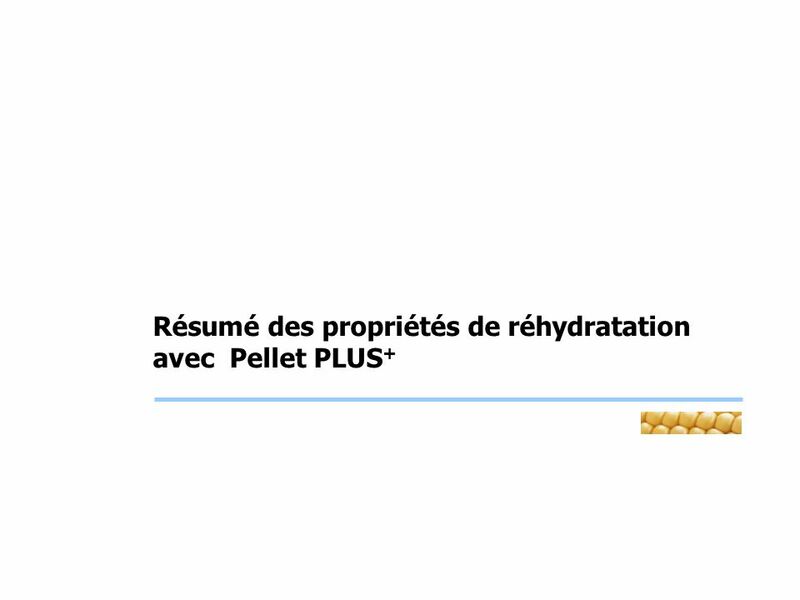 L’application change en fonction de l’humidité captée par les senseurs. 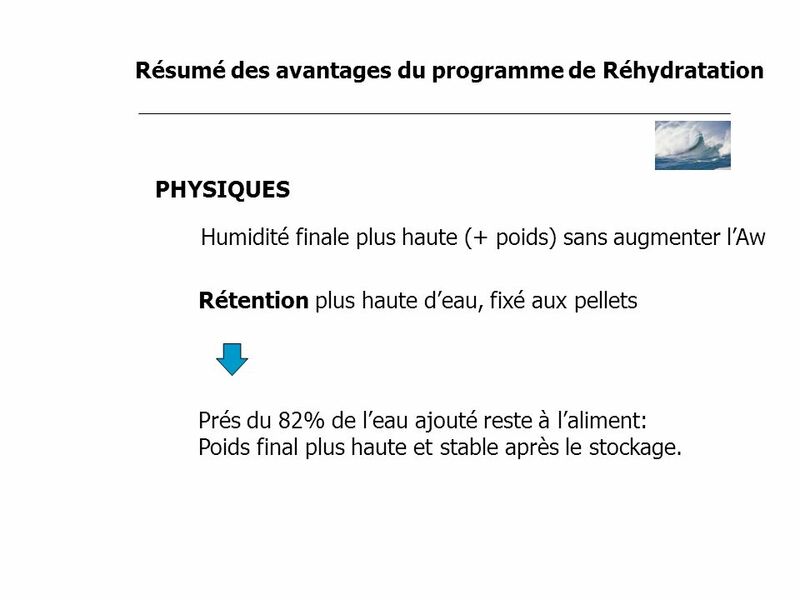 PHYSIQUES Humidité finale plus haute (+ poids) sans augmenter l’Aw Rétention plus haute d’eau, fixé aux pellets Prés du 82% de l’eau ajouté reste à l’aliment: Poids final plus haute et stable après le stockage. 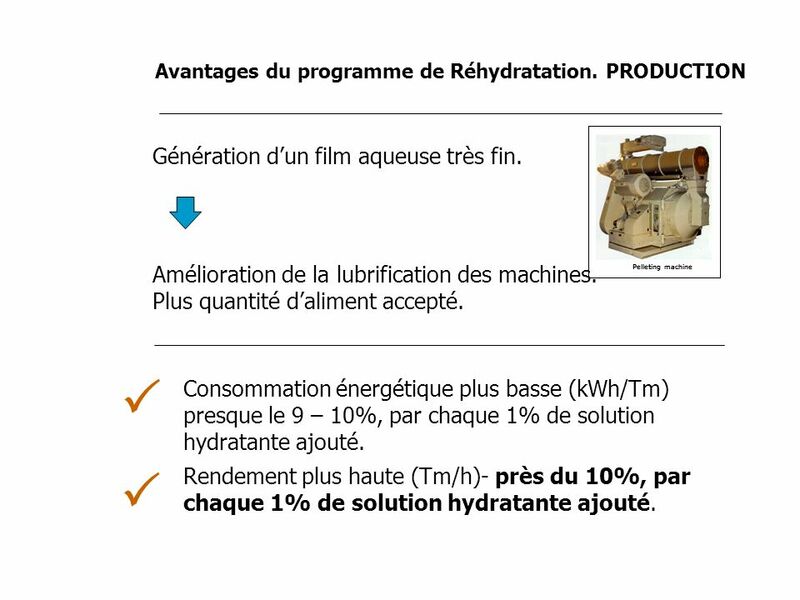 9   Génération d’un film aqueuse très fin. 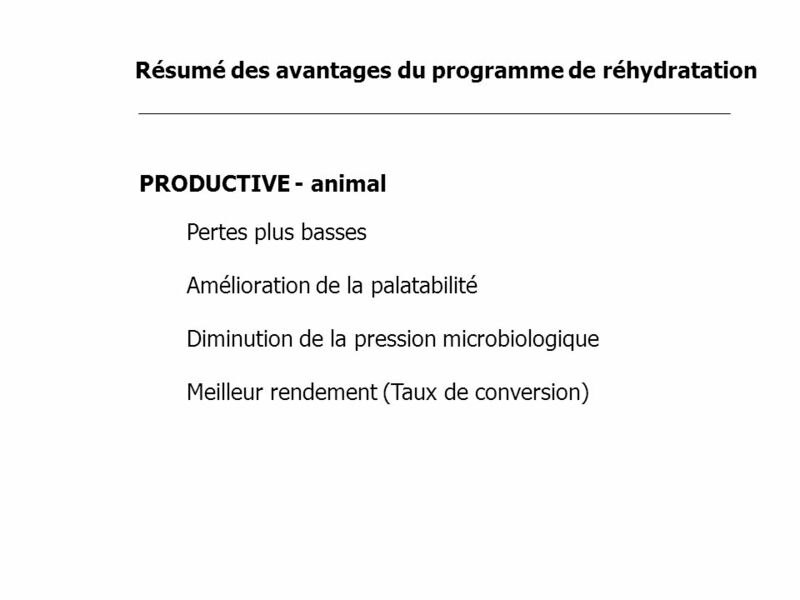 Avantages du programme de Réhydratation. 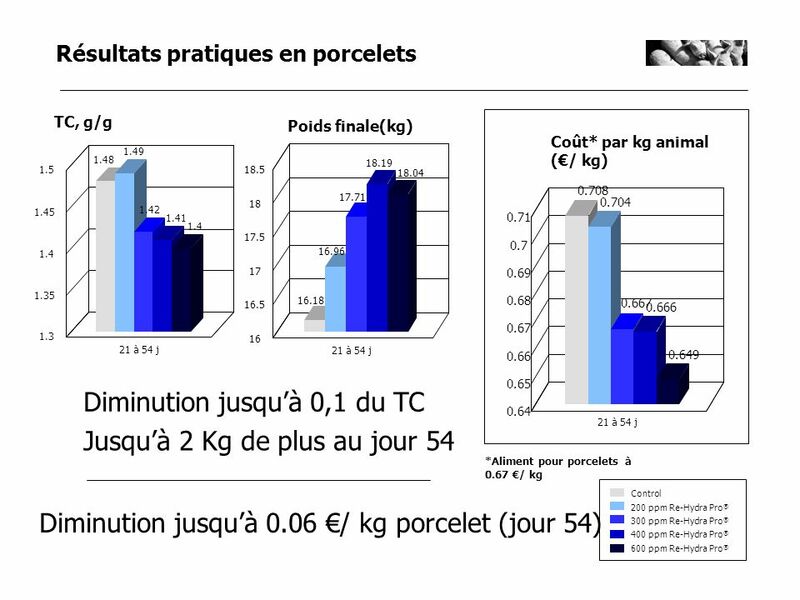 PRODUCTION Génération d’un film aqueuse très fin. 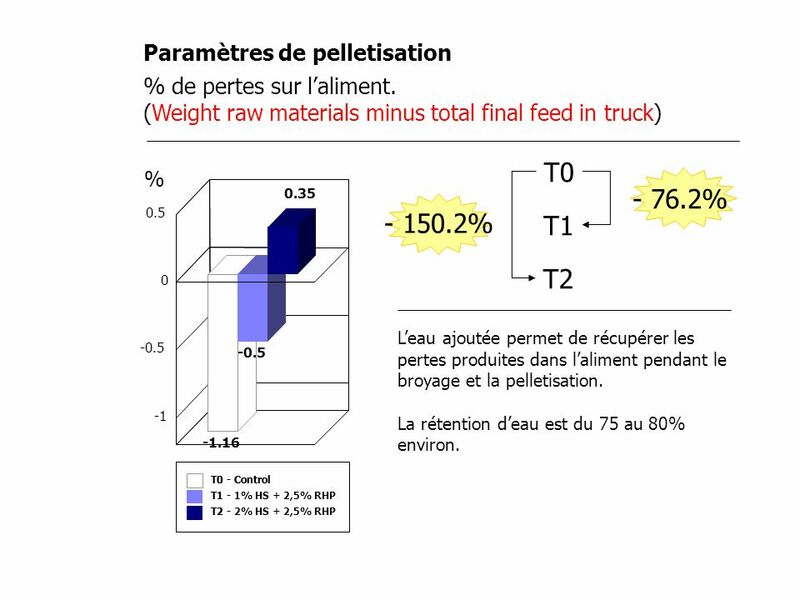 Amélioration de la lubrification des machines. 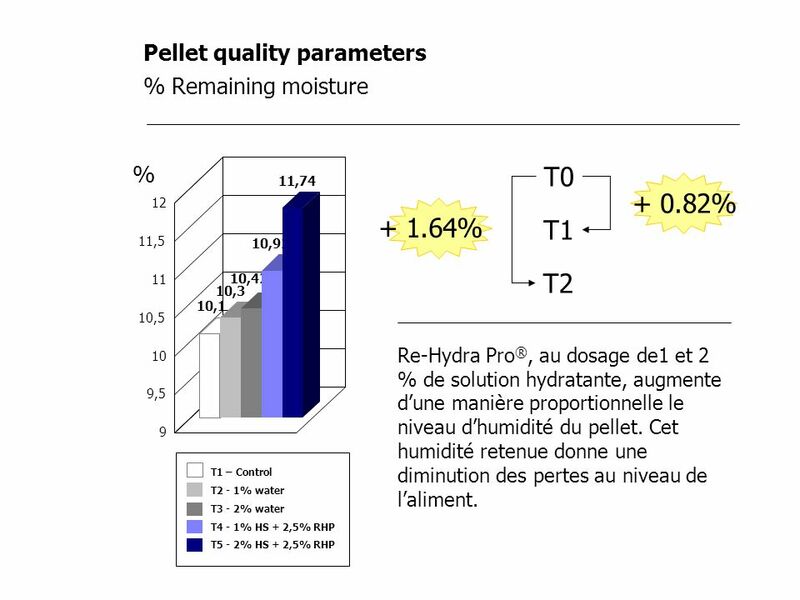 Plus quantité d’aliment accepté. 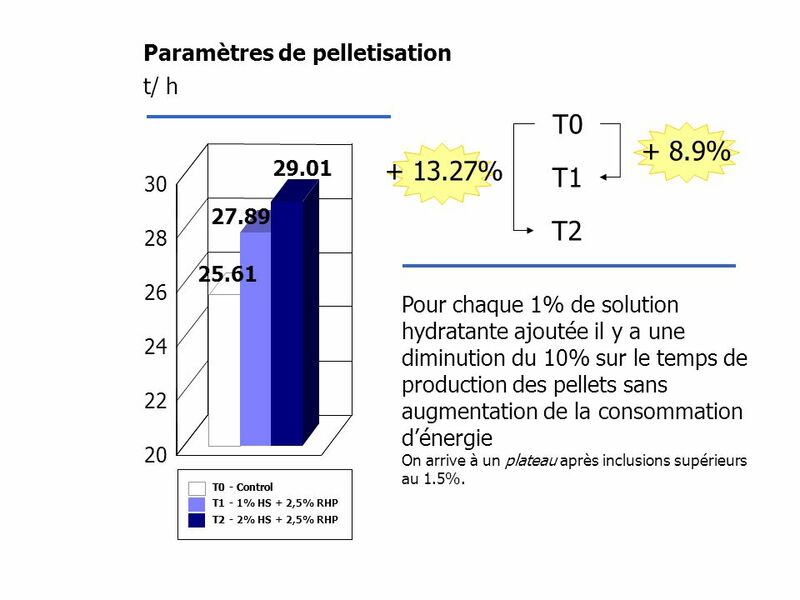 Pelleting machine  Consommation énergétique plus basse (kWh/Tm) presque le 9 – 10%, par chaque 1% de solution hydratante ajouté. 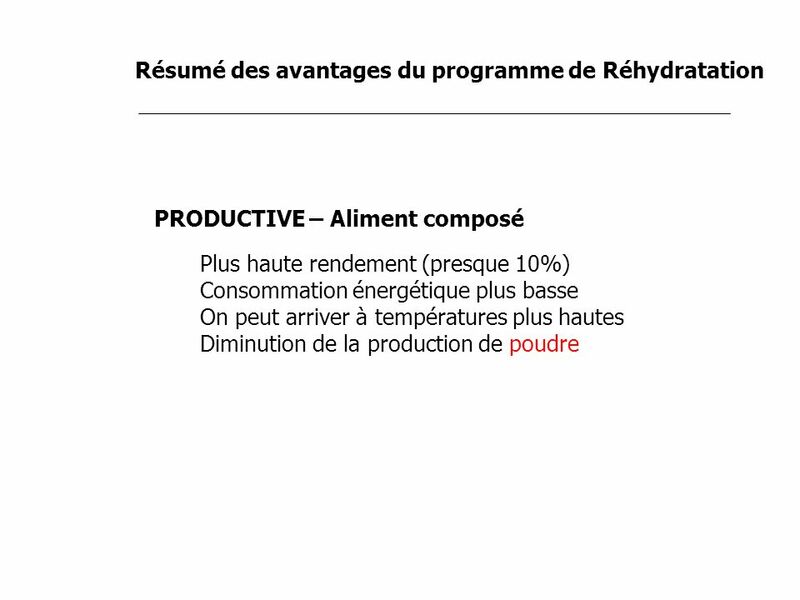  Rendement plus haute (Tm/h)- près du 10%, par chaque 1% de solution hydratante ajouté. 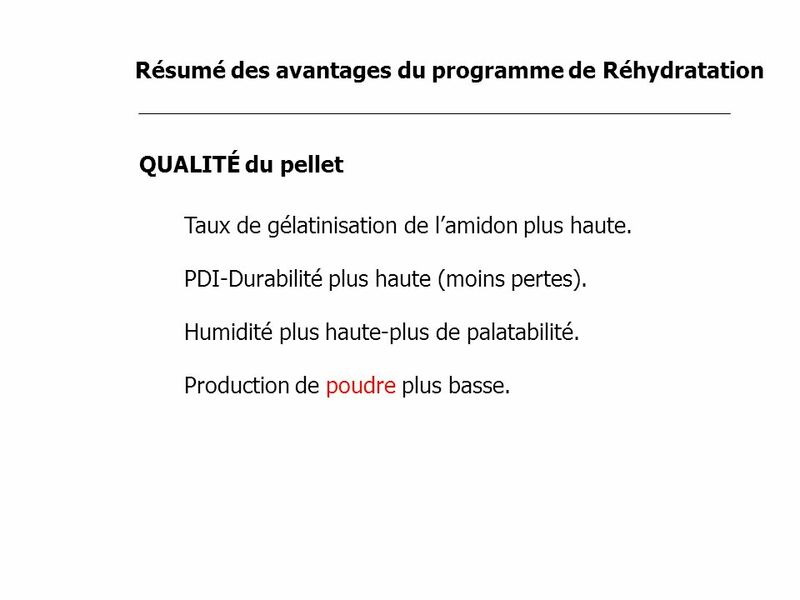 QUALITÉ du pellet Taux de gélatinisation de l’amidon plus haute. 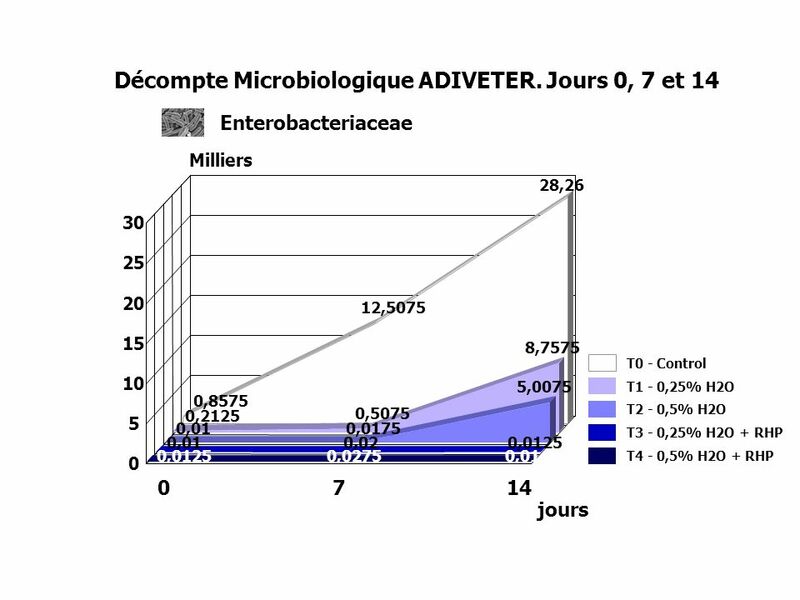 PDI-Durabilité plus haute (moins pertes). 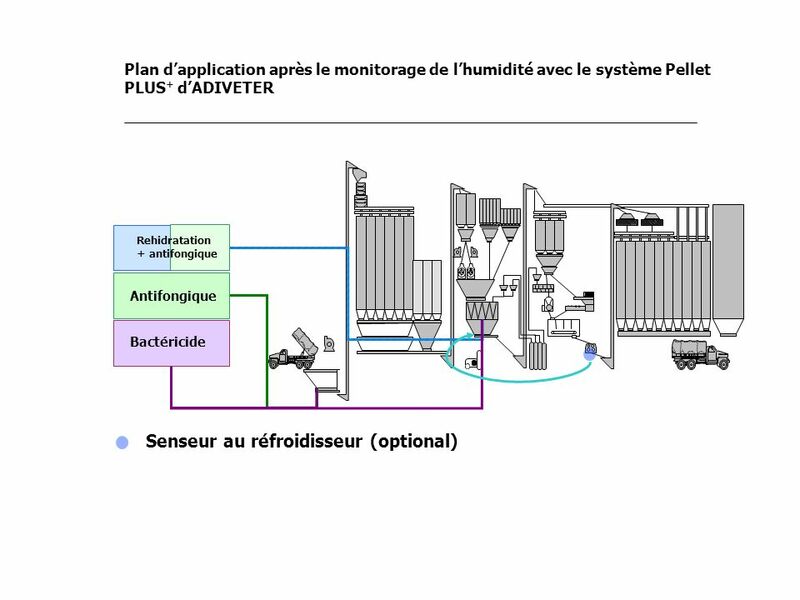 Humidité plus haute-plus de palatabilité. 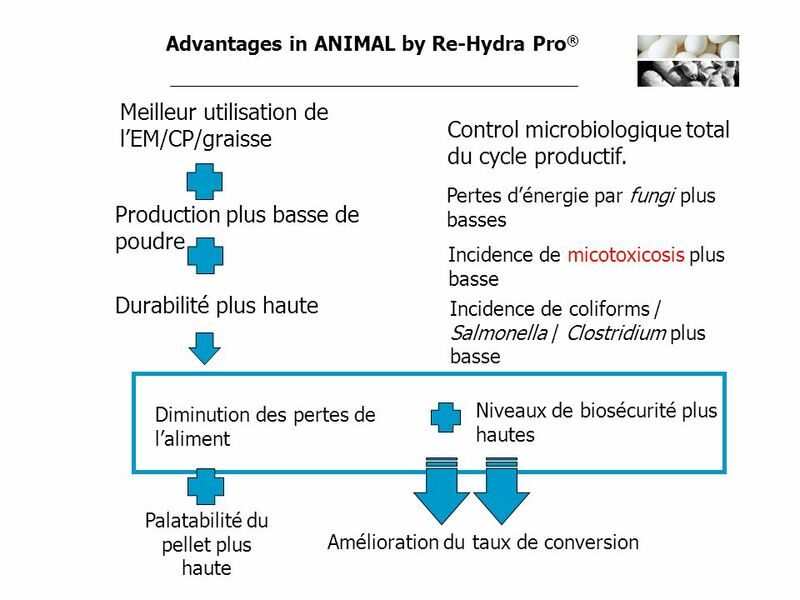 Production de poudre plus basse. 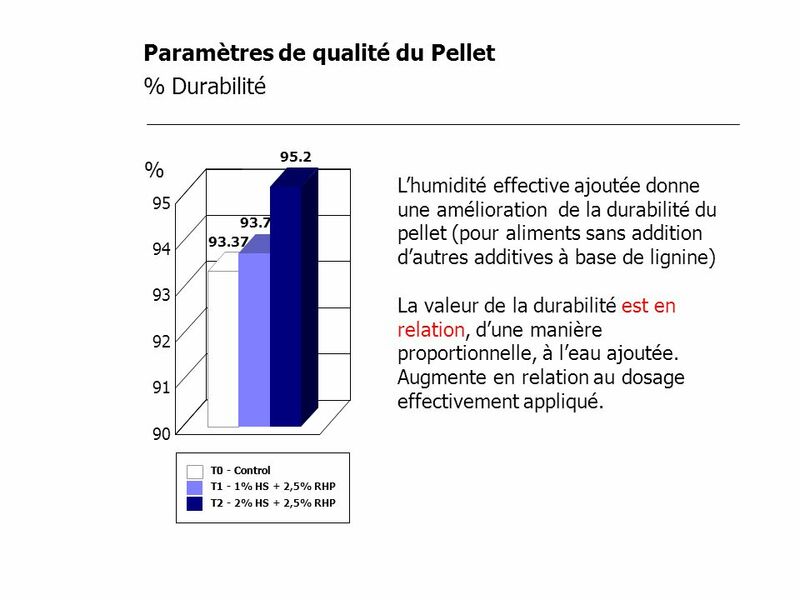 Amélioration du taux de gélatinisation de l’amidon Du 4 au 7% de plus; >20% et prêt du 30% Meilleur PDI (Taux de Durabilité du Pellet) – presque le 3% de plus: Plus haute fixation du pellet Taux de poudre plus basse Meilleur assimilation de l’énergie métabolisable à cause de la destruction de la couverture fibreuse des particules d’amidon/accès au CP/accès aux dépôts lipidiques. 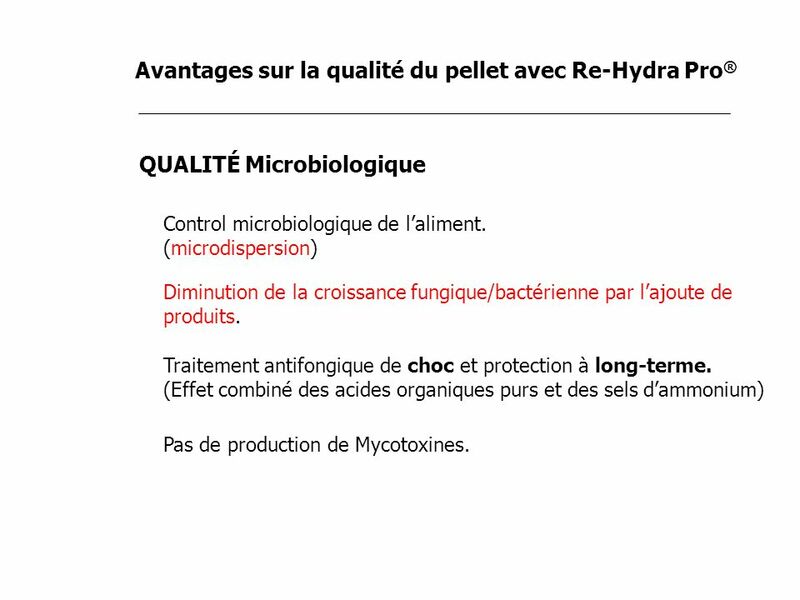 QUALITÉ Microbiologique Control microbiologique de l’aliment. 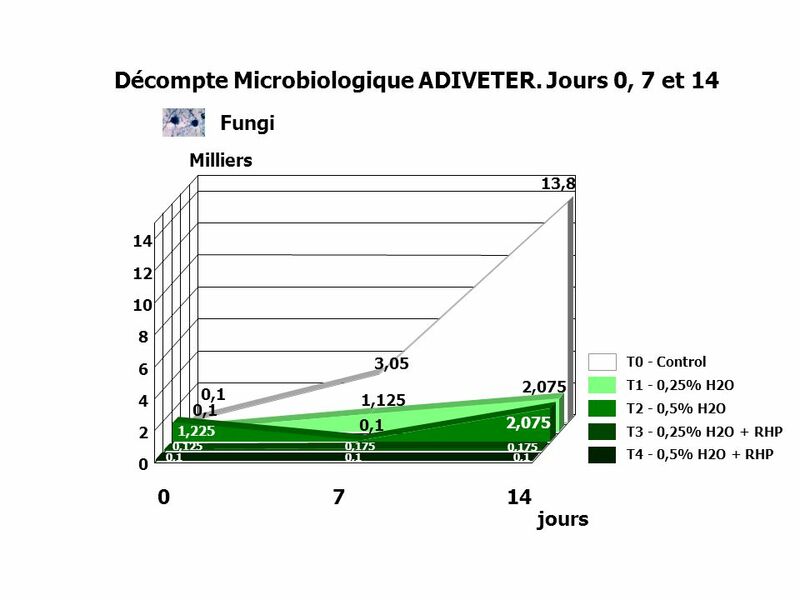 (microdispersion) Diminution de la croissance fungique/bactérienne par l’ajoute de produits. 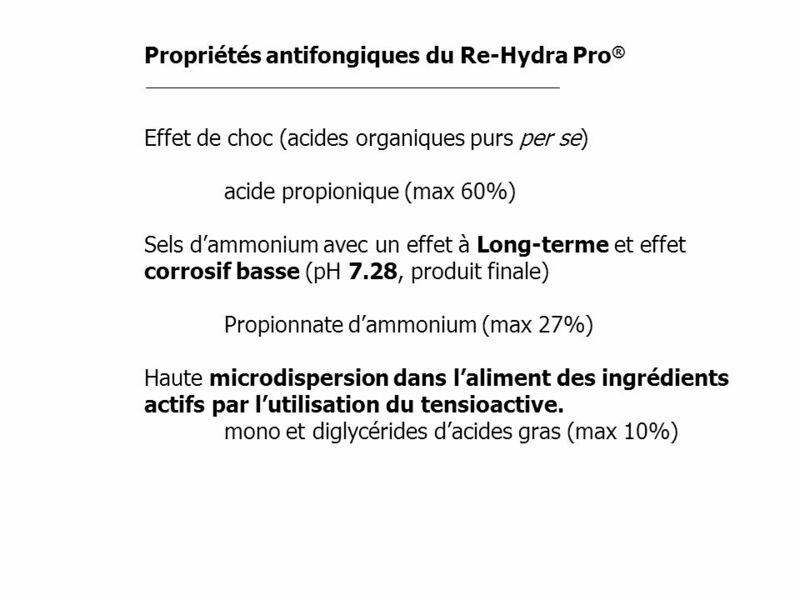 Traitement antifongique de choc et protection à long-terme. 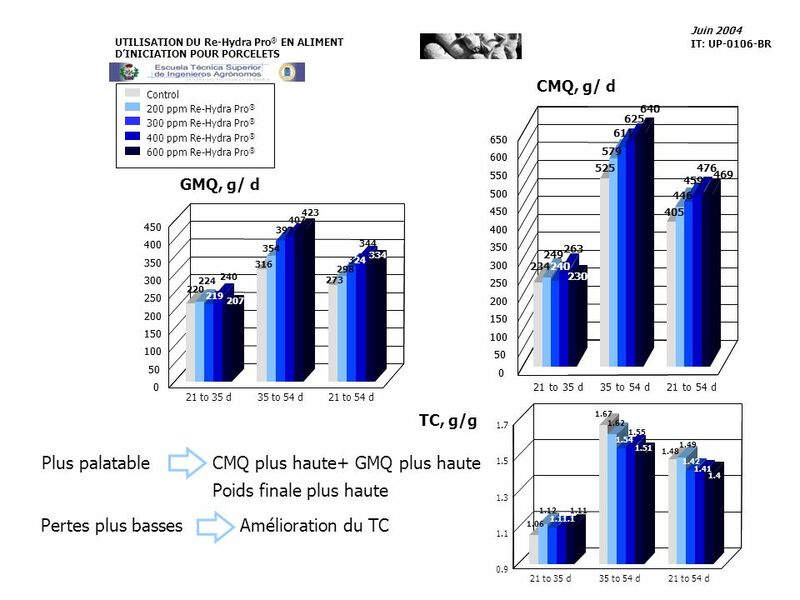 (Effet combiné des acides organiques purs et des sels d’ammonium) Pas de production de Mycotoxines. 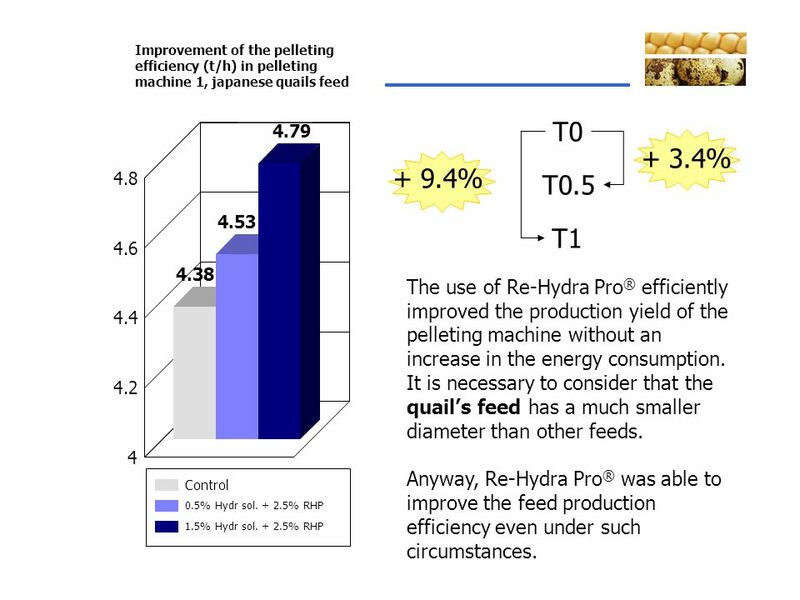 T1 - Feed with 1% Hydrating solution + 2.5% Re-Hydra Pro® T2 - Feed with 2% Hydrating solution + 2.5% Re-Hydra Pro® Each experimental treatment was composed of four production replicates (with the exception of treatment 0, with 8 replicates) Each replicate consisted of a pelleting of 50,000 kg (10 blendings of 5,000 kg of feed for swine fattening, each) Each experimental day included a T0 and one or two of the other experimental treatments (100,000 or 150,000 kg production, according to the schedule of production of every day) The application of Re-Hydra Pro® was carried out directly in the mixer (90%) and after cooling (10% prior to the fat addition) Pelleting temperature was set at 70% and load at 85% to directly evaluate the effect of the additive on production parameters after the improvement in the pelleting yield. 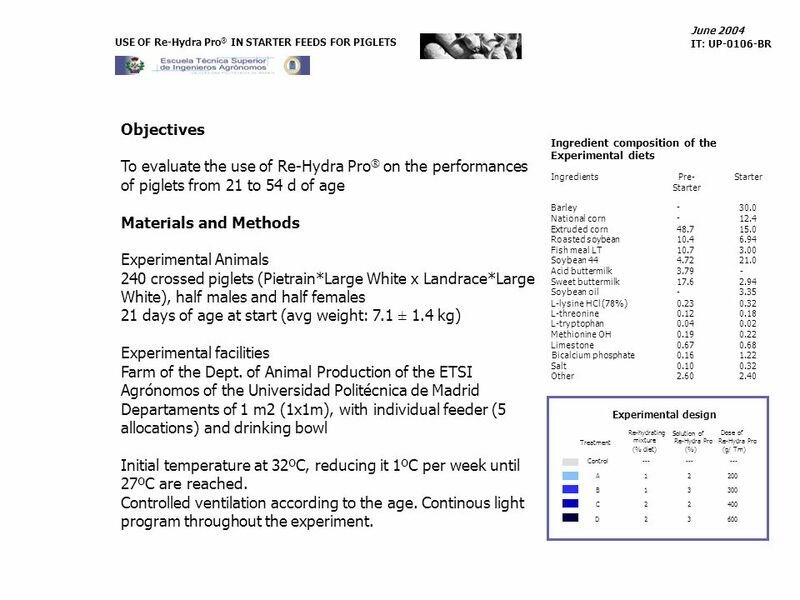 Objectives To study the effect of the addition of a re-hydrating mixtre (at growing doses from 200 to 600 ppm) on the performances of the piglets. 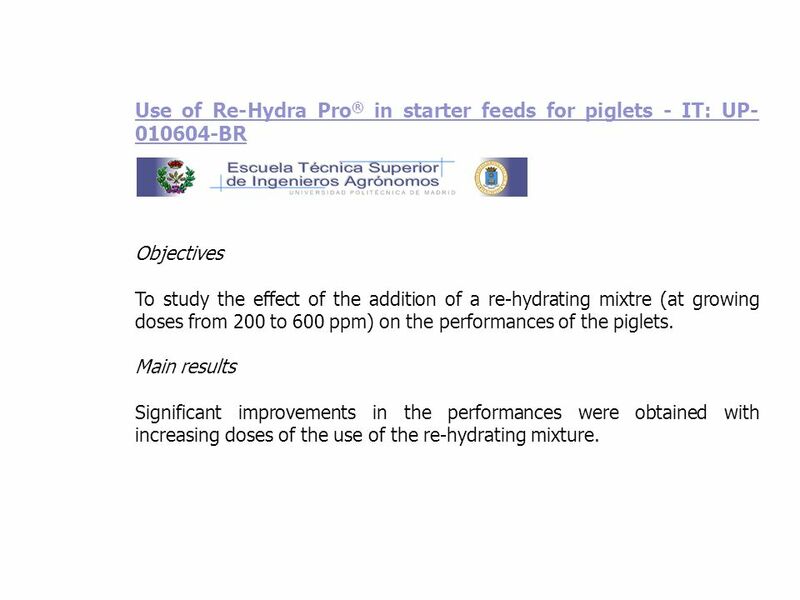 Main results Significant improvements in the performances were obtained with increasing doses of the use of the re-hydrating mixture. 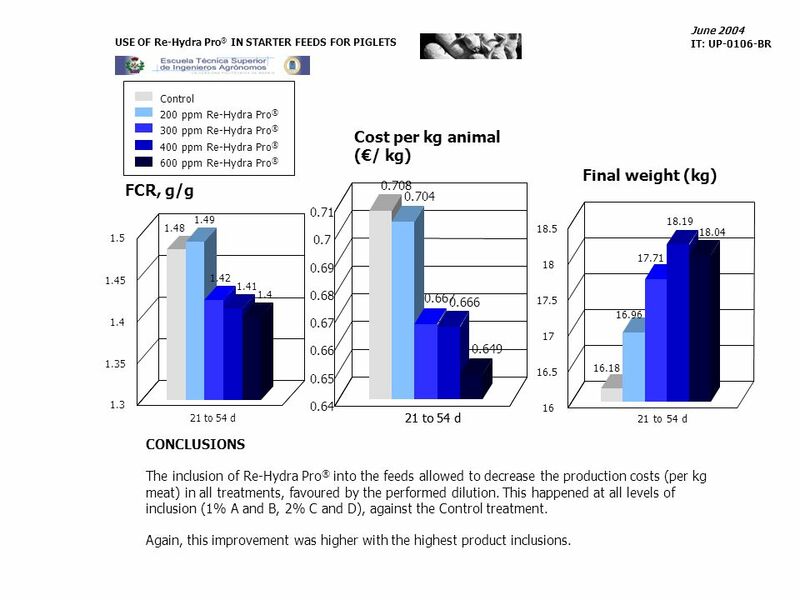 June 2004 USE OF Re-Hydra Pro® IN STARTER FEEDS FOR PIGLETS IT: UP-0106-BR Control 200 ppm Re-Hydra Pro® 300 ppm Re-Hydra Pro® Cost per kg animal (€/ kg) 400 ppm Re-Hydra Pro® 600 ppm Re-Hydra Pro® Final weight (kg) FCR, g/g 0.708 0.708 0.704 0.704 0.71 1.49 1,49 18.19 1,48 1.48 18.5 18.04 1.5 0.7 17.71 0.69 18 1.45 1.42 1,42 1.41 1,41 1,4 1.4 0.68 0.667 0.667 0.666 0.666 17.5 16.96 1.4 0.67 17 0.66 0.649 0.649 1.35 16.5 16.18 0.65 1.3 0.64 16 21 to 54 d 21 to 54 d 21 to 54 d 21 to 54 d CONCLUSIONS The inclusion of Re-Hydra Pro® into the feeds allowed to decrease the production costs (per kg meat) in all treatments, favoured by the performed dilution. 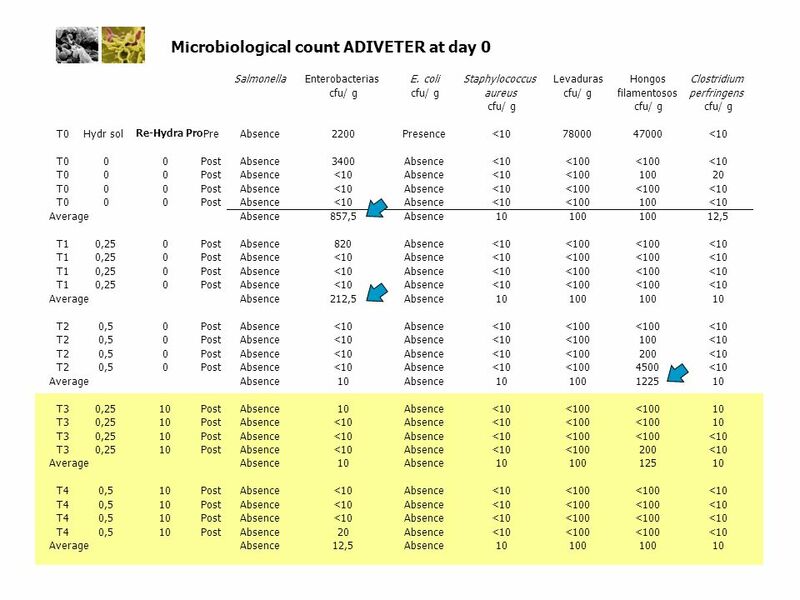 This happened at all levels of inclusion (1% A and B, 2% C and D), against the Control treatment. 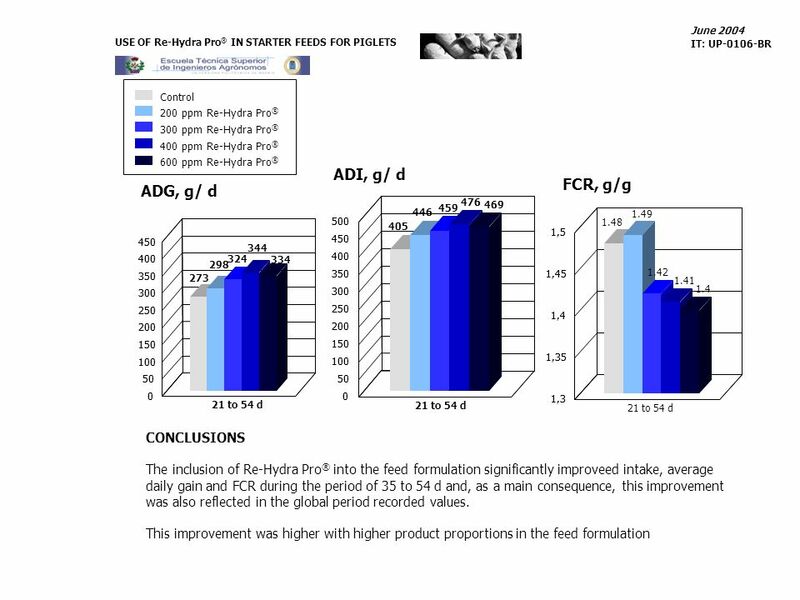 Again, this improvement was higher with the highest product inclusions. 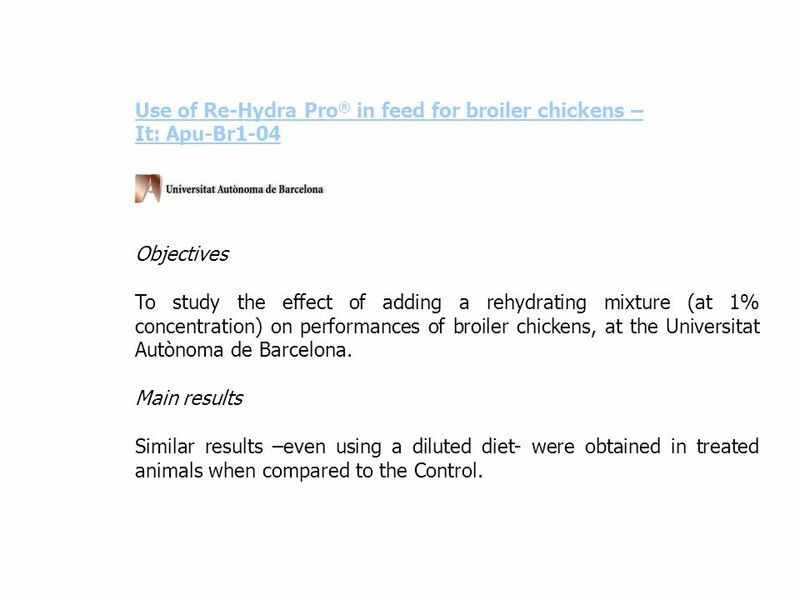 It: Apu-Br1-04 Objectives To study the effect of adding a rehydrating mixture (at 1% concentration) on performances of broiler chickens, at the Universitat Autònoma de Barcelona. 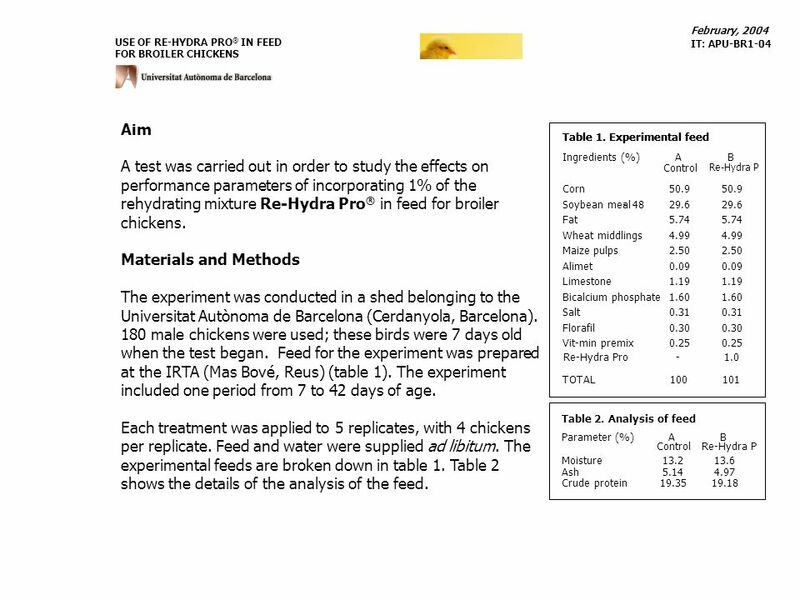 Main results Similar results –even using a diluted diet- were obtained in treated animals when compared to the Control. 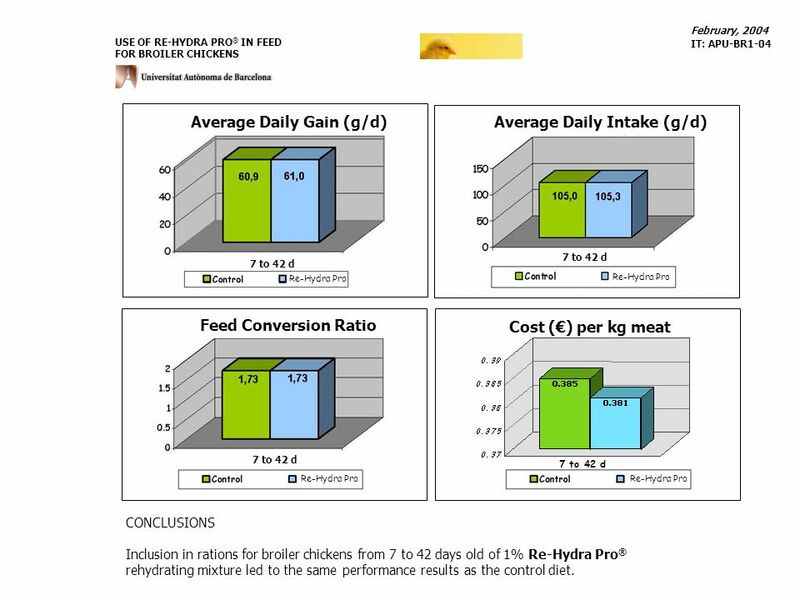 February, 2004 USE OF RE-HYDRA PRO® IN FEED FOR BROILER CHICKENS IT: APU-BR1-04 Average Daily Gain (g/d) Average Daily Intake (g/d) 7 to 42 d 7 to 42 d Re-Hydra Pro Re-Hydra Pro Feed Conversion Ratio Cost (€) per kg meat 7 to 42 d 7 to 42 d Re-Hydra Pro Re-Hydra Pro CONCLUSIONS Inclusion in rations for broiler chickens from 7 to 42 days old of 1% Re-Hydra Pro® rehydrating mixture led to the same performance results as the control diet. 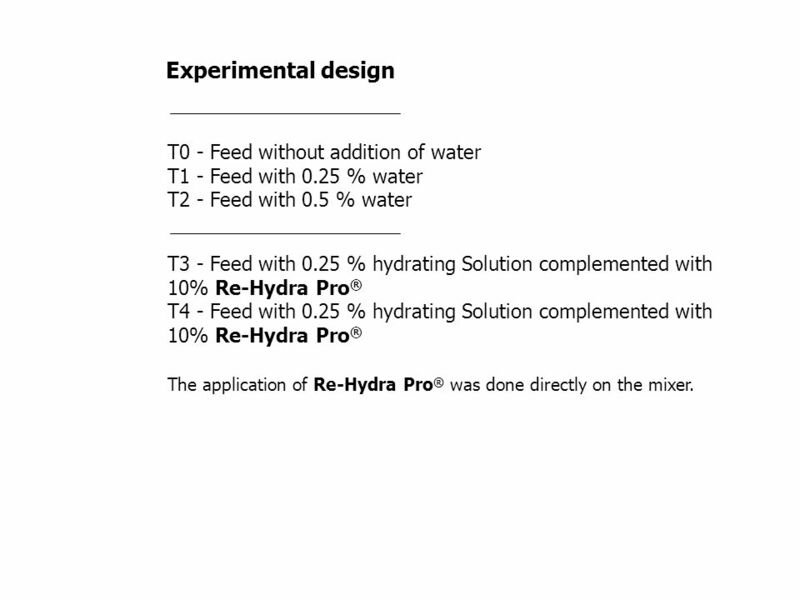 T0.5 - Feed with 0.5% Hydrating solution + 2.5% Re-Hydra Pro® T1 - Feed with 1.5% Hydrating solution + 2.5% Re-Hydra Pro® Each experimental treatment was composed of two production replicates (with the exception of treatment 0.5, with 1 replicates), determined in two different days (for two different pelleting machines and two different feeds) Each replicate consisted of a pelleting of 9,000 kg (3 blendings of 3,000 kg of feed for japanese quails and horses feeds, each) Each experimental day included one replicate of T0 production and one (horses feed) or two (japanese quails) of the other experimental treatments. 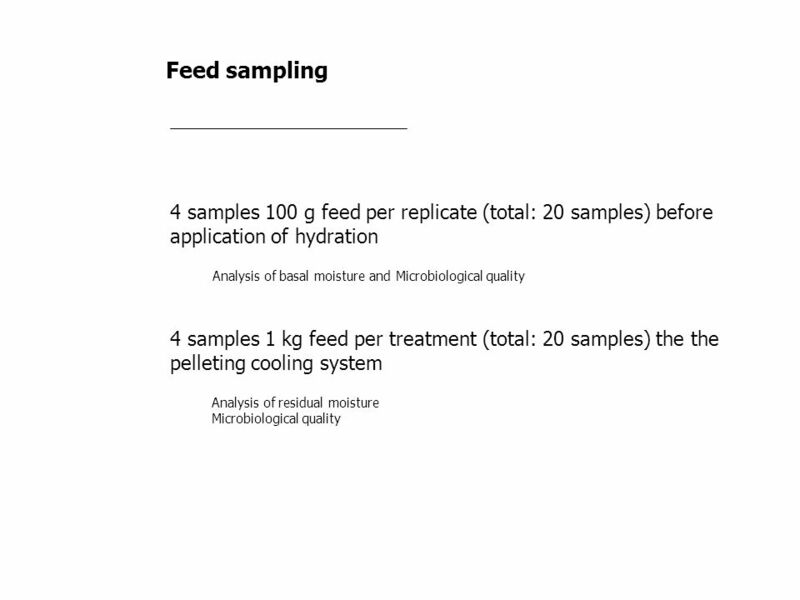 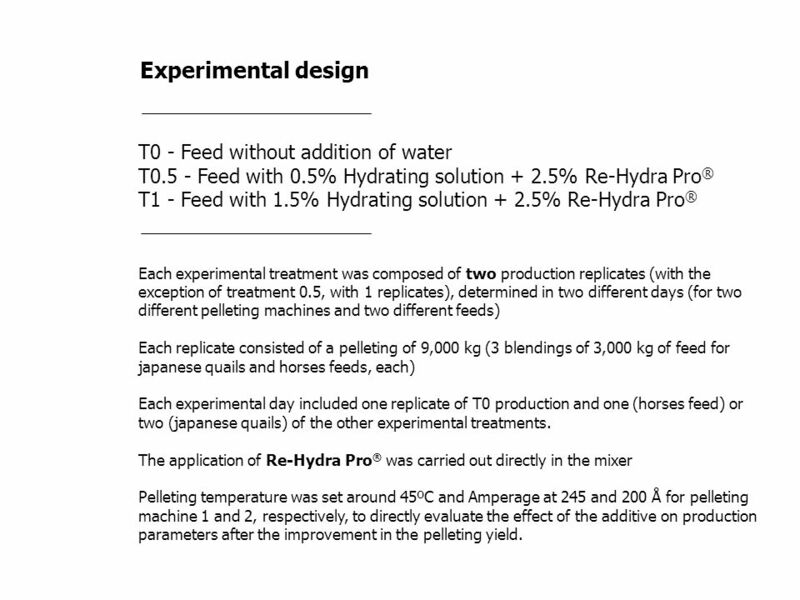 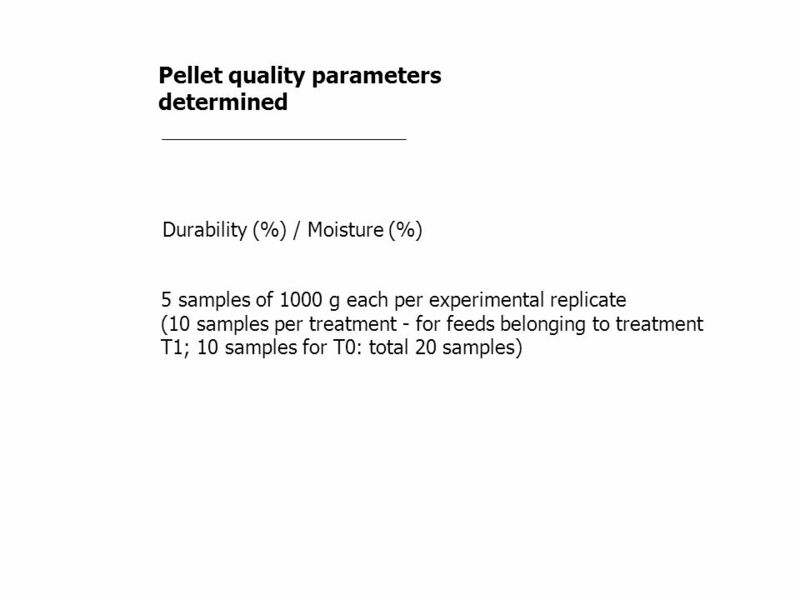 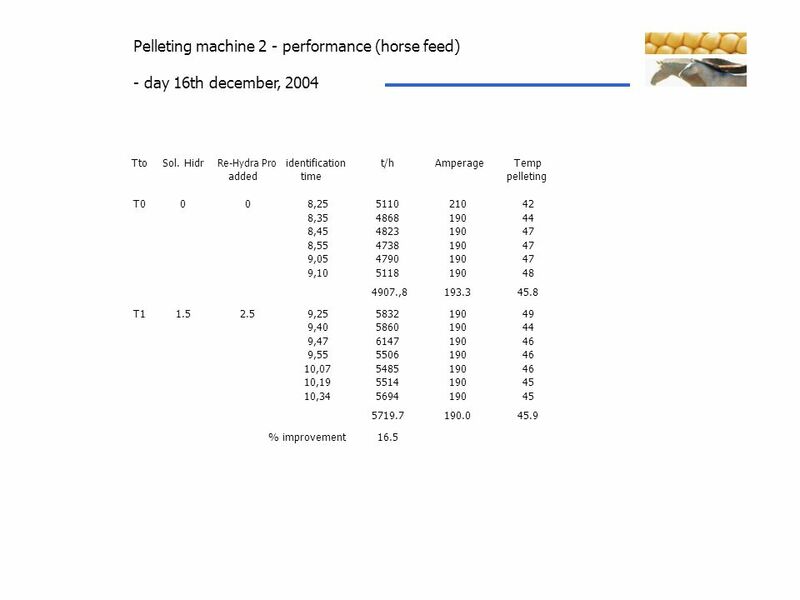 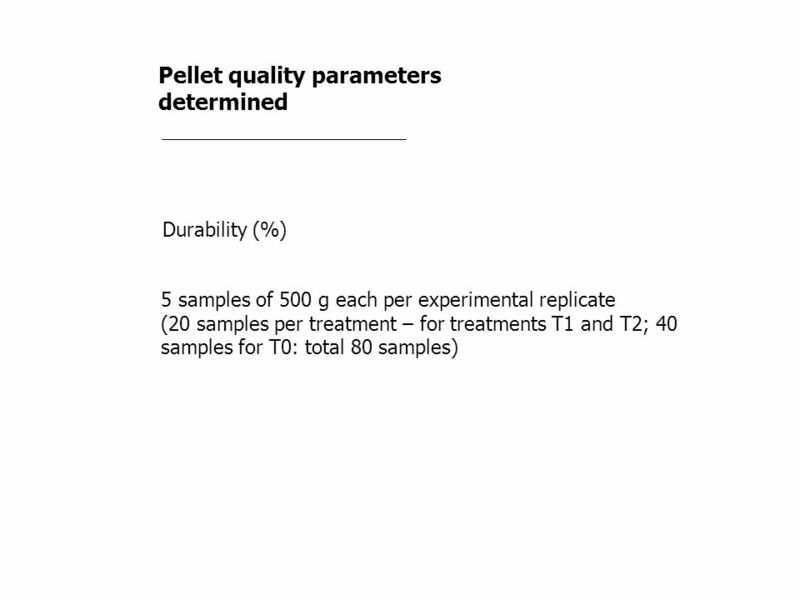 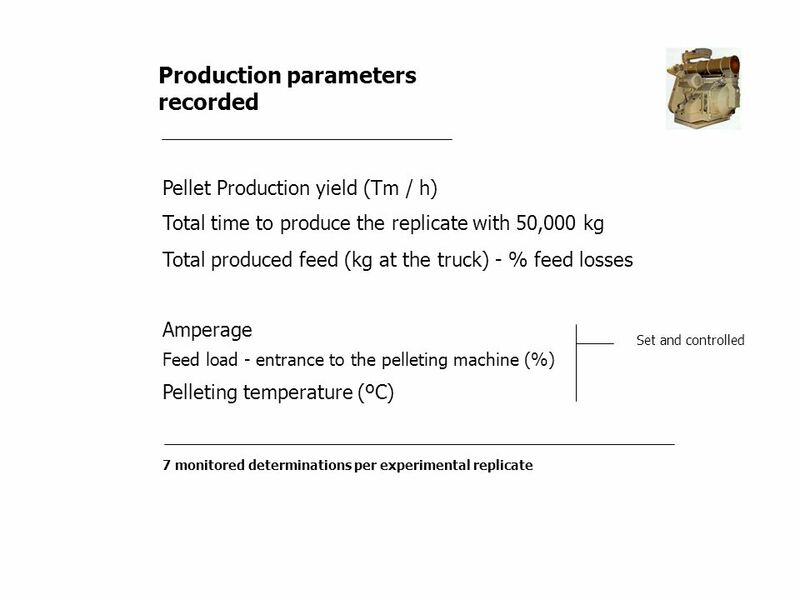 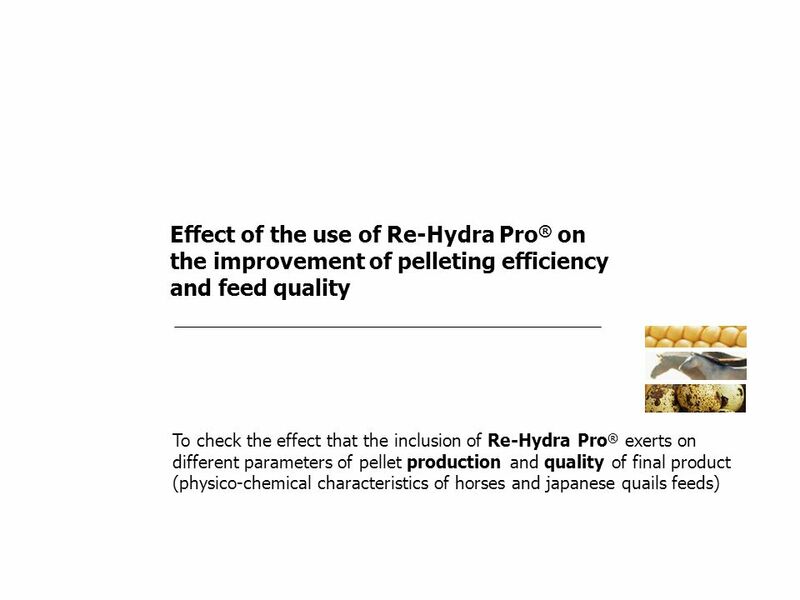 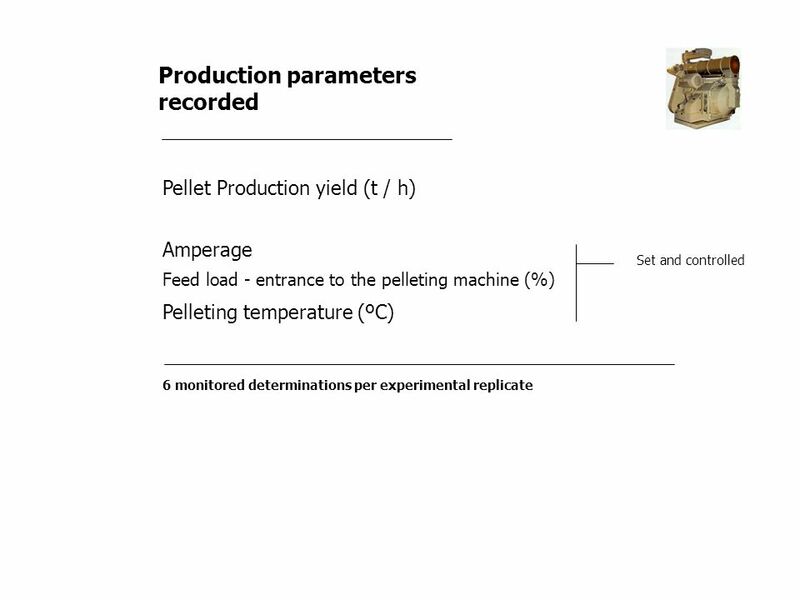 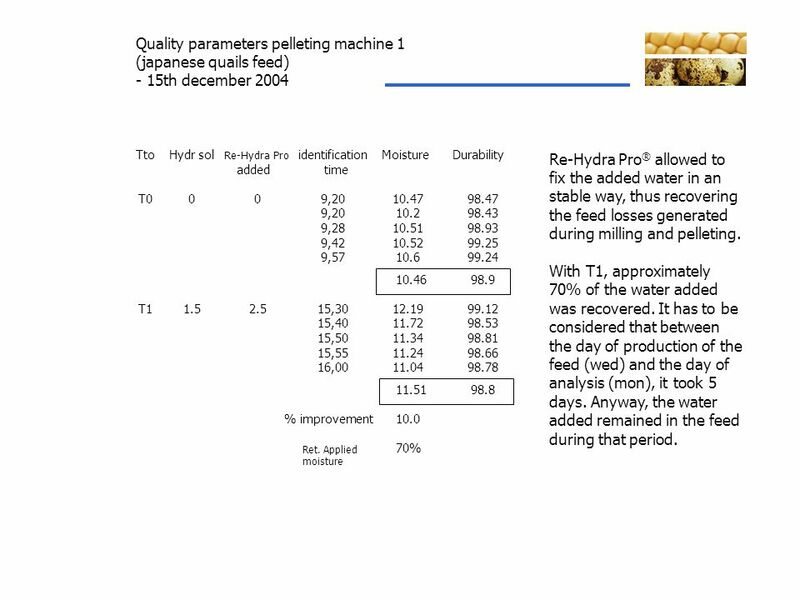 The application of Re-Hydra Pro® was carried out directly in the mixer Pelleting temperature was set around 45ºC and Amperage at 245 and 200 Å for pelleting machine 1 and 2, respectively, to directly evaluate the effect of the additive on production parameters after the improvement in the pelleting yield. 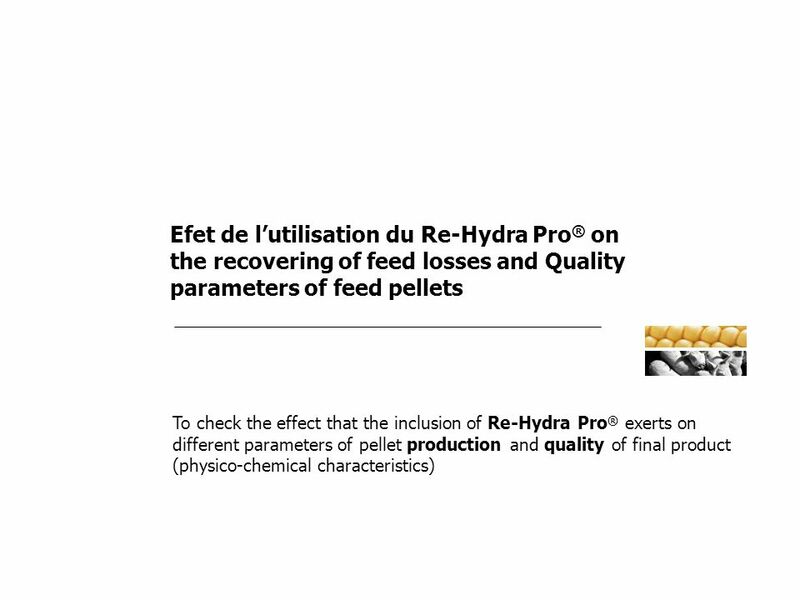 - 15th december 2004 Tto Hydr sol Re-Hydra Pro identification Moisture Durability added time T0 9,20 10.47 98.47 10.2 98.43 9,28 10.51 98.93 9,42 10.52 99.25 9,57 10.6 99.24 10.46 98.9 T1 1.5 2.5 15,30 12.19 99.12 15,40 11.72 98.53 15,50 11.34 98.81 15,55 11.24 98.66 16,00 11.04 98.78 11.51 98.8 % improvement 10.0 Ret. 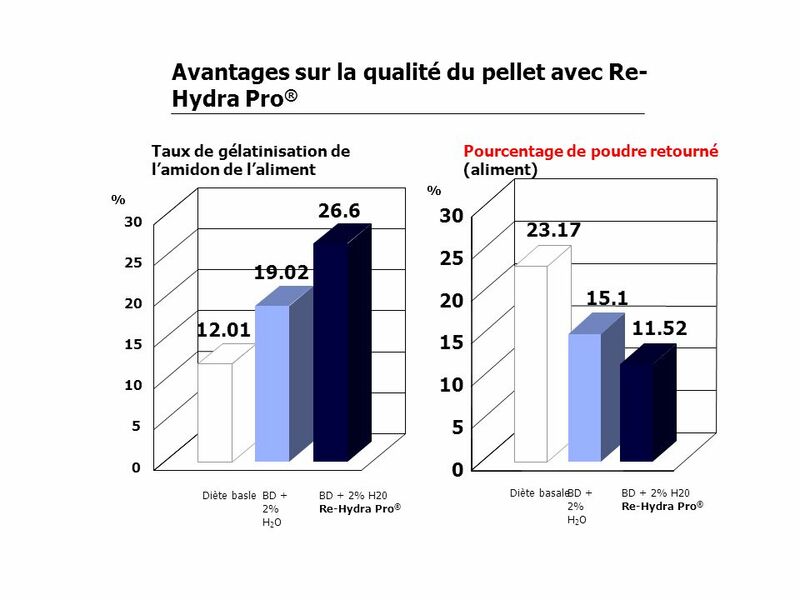 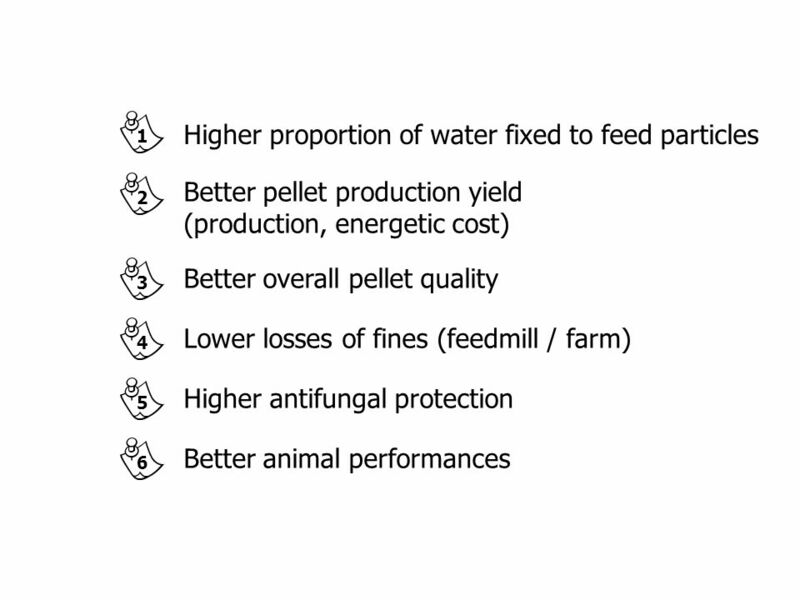 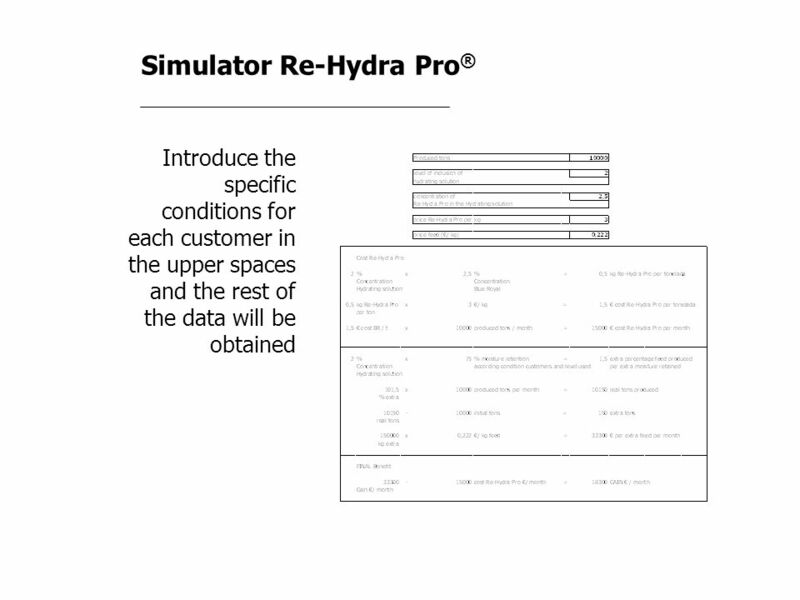 Applied moisture 70% Re-Hydra Pro® allowed to fix the added water in an stable way, thus recovering the feed losses generated during milling and pelleting. 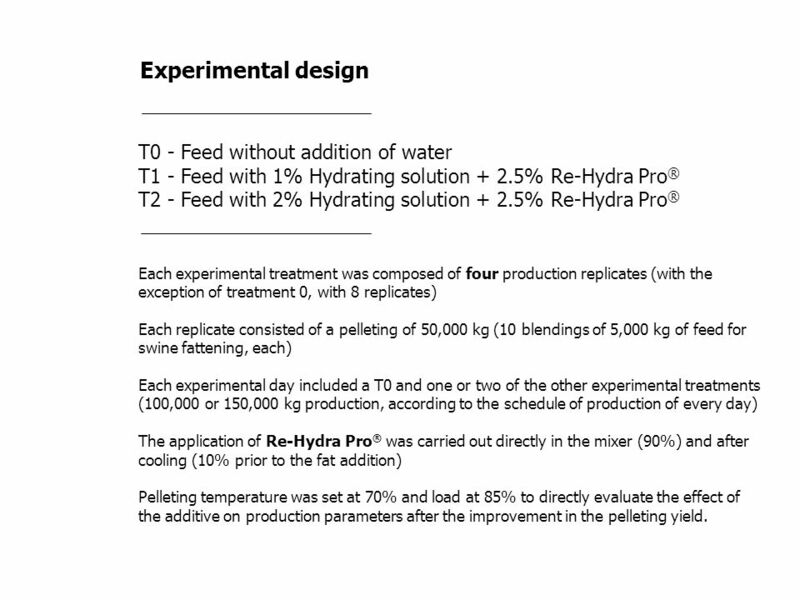 With T1, approximately 70% of the water added was recovered. 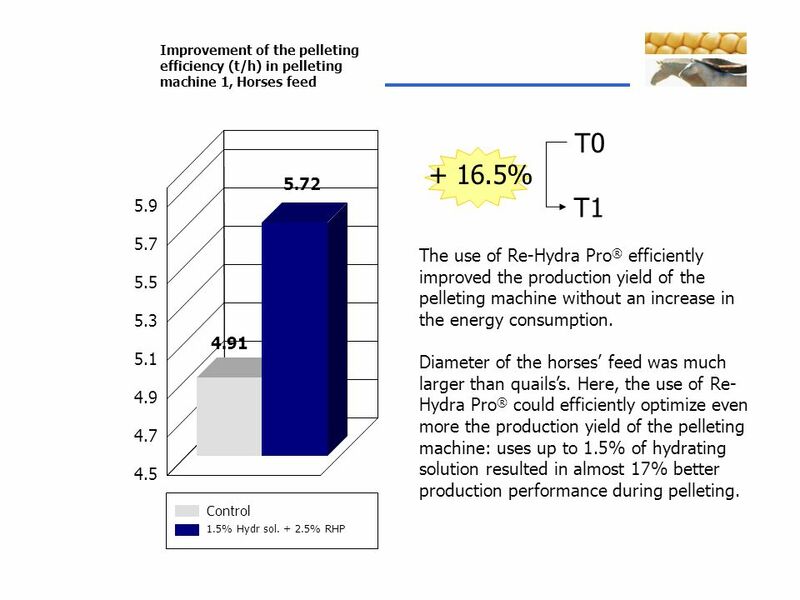 It has to be considered that between the day of production of the feed (wed) and the day of analysis (mon), it took 5 days. 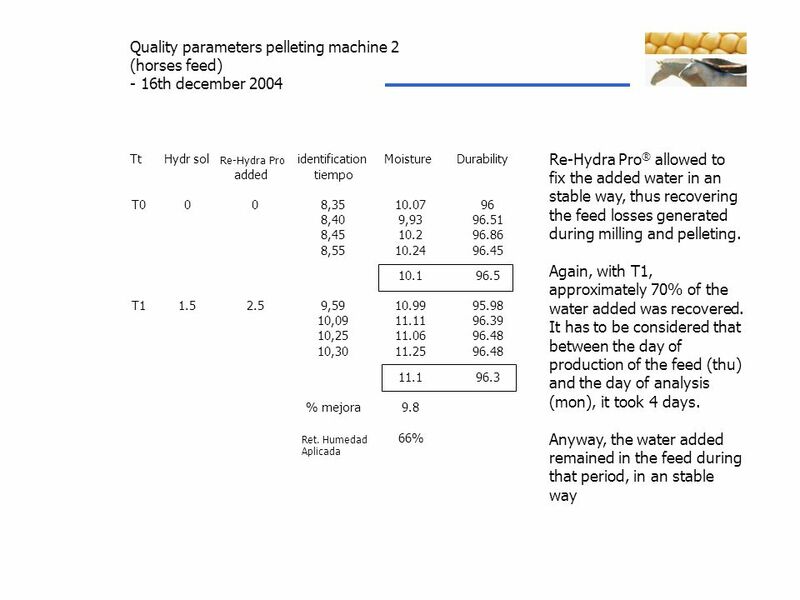 Anyway, the water added remained in the feed during that period. 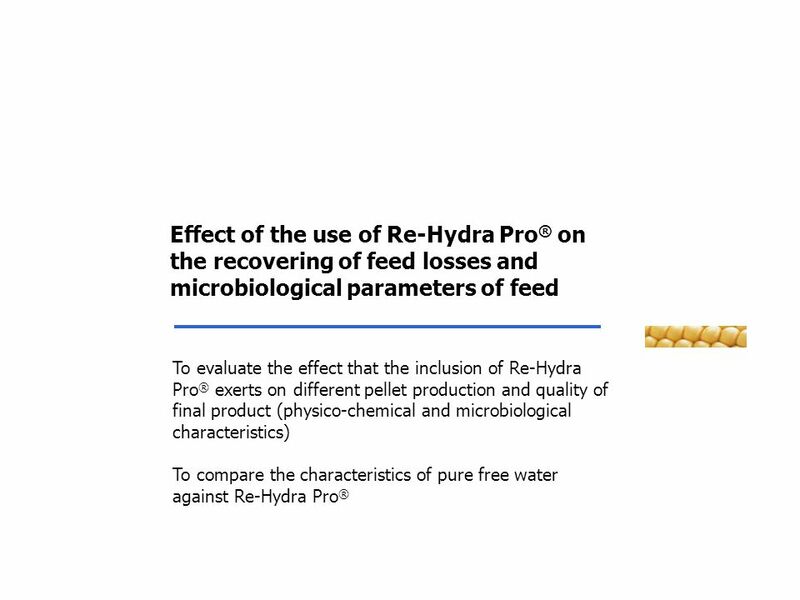 T1 - Feed with 0.25 % water T2 - Feed with 0.5 % water T3 - Feed with 0.25 % hydrating Solution complemented with 10% Re-Hydra Pro® T4 - Feed with 0.25 % hydrating Solution complemented with 10% Re-Hydra Pro® The application of Re-Hydra Pro® was done directly on the mixer. 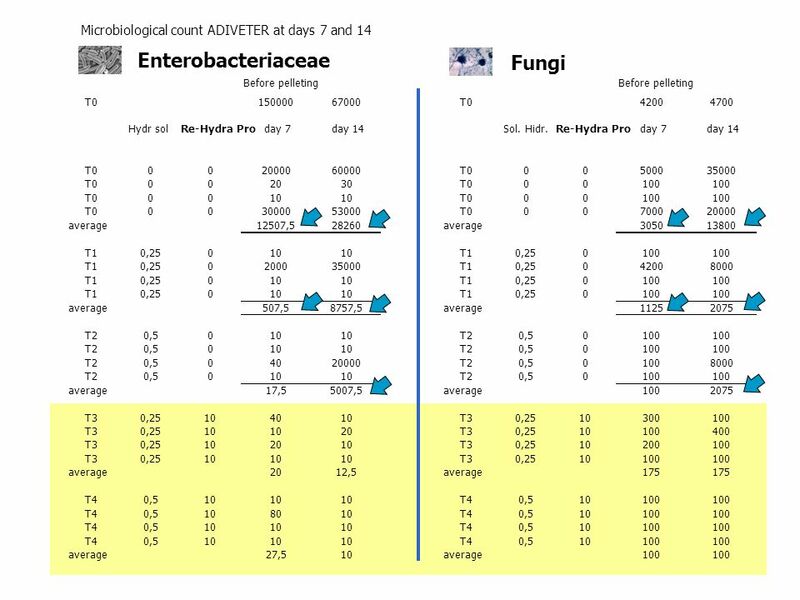 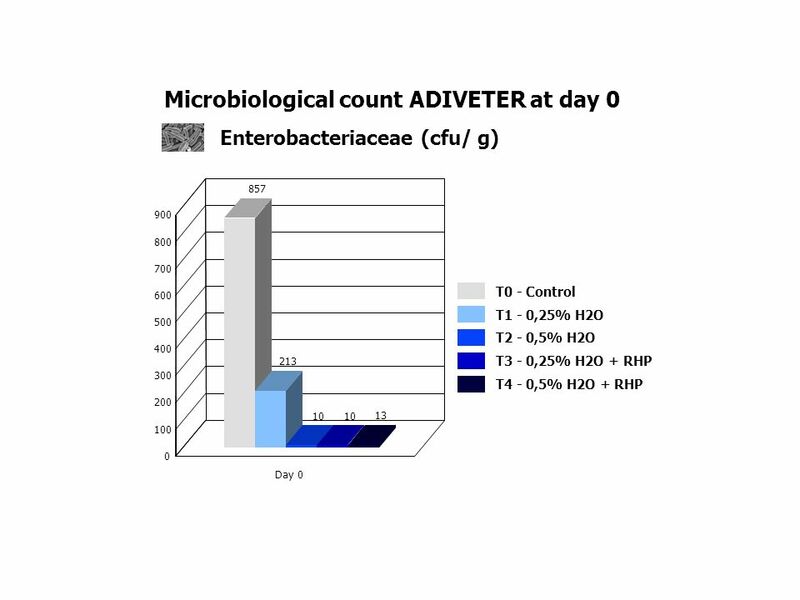 thousands of fungal cfu/ g -1 1 5 10 15 20 25 30 40 60 80 100 120 140 Basal Diet BD + 2% Water BD + 2% Water + tensioactive BD + 2% H20 Re-Hydra Pro® Storage days after pelleting The addition of total moisture (2%) reached levels of 12.4%, 12.8% and 13.7% for BD + 2% water, BD + 2% water + tensioactive and BD + 2% Water plus Re-Hydra Pro® (2%), respectively, after pelleting Storage conditions favoured a fast fungal growth (29ºC, RH: 85%) as accelerated tests for microbiological stability. 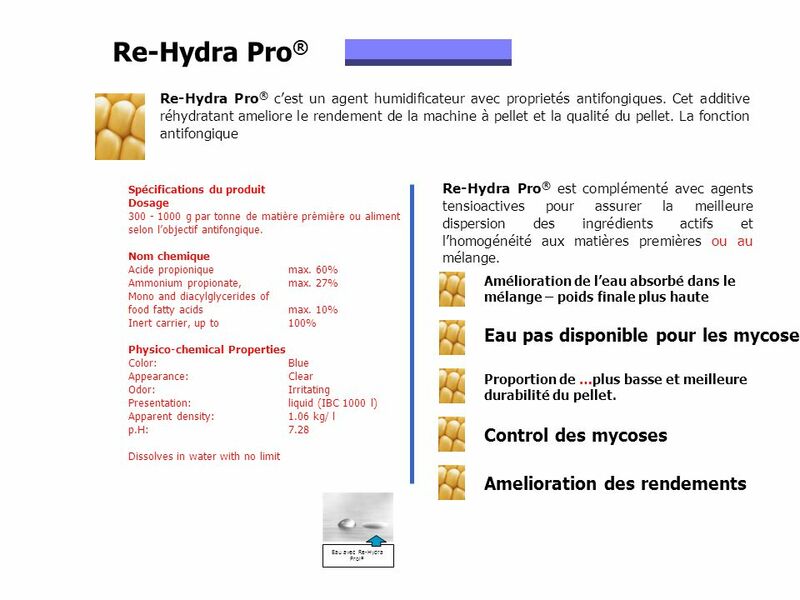 The lower fungal growth after the application of Re-Hydra Pro® may be explained because of the control of the available water as well as because of the antifungal treatment applied through Re-Hydra Pro®. 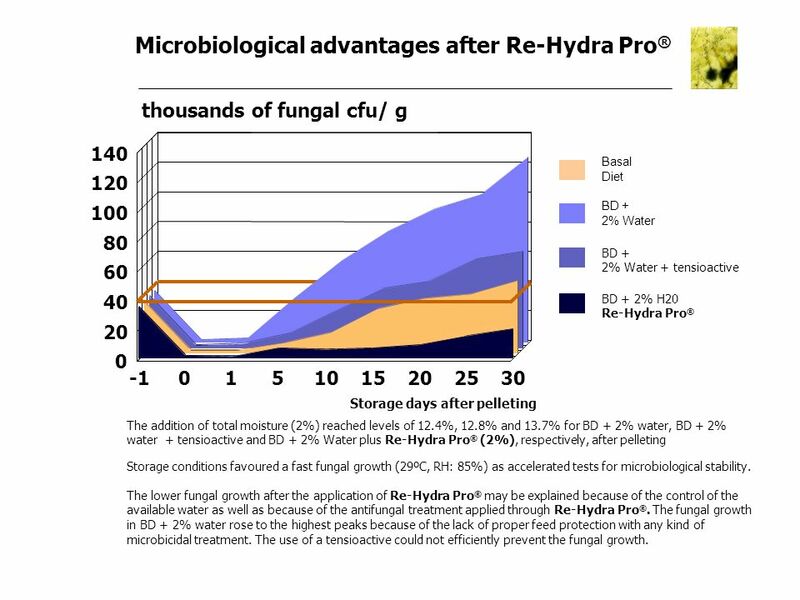 The fungal growth in BD + 2% water rose to the highest peaks because of the lack of proper feed protection with any kind of microbicidal treatment. 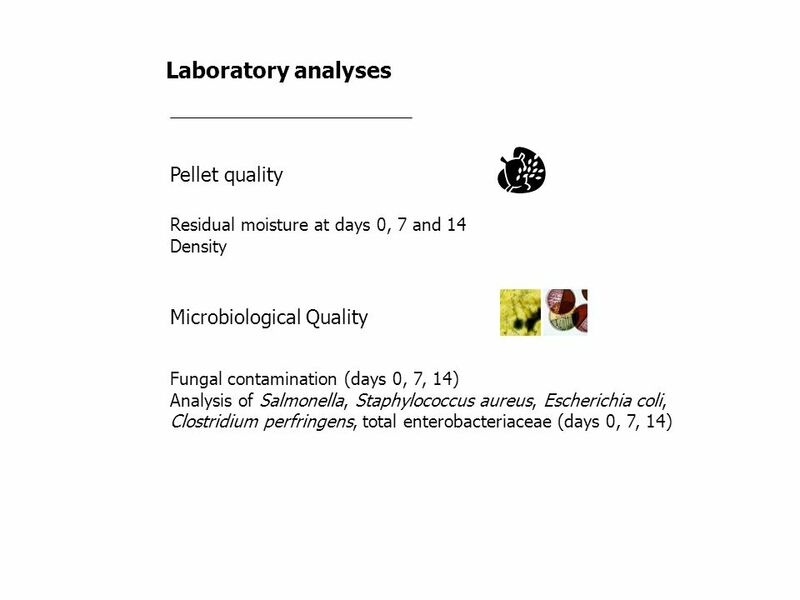 The use of a tensioactive could not efficiently prevent the fungal growth. 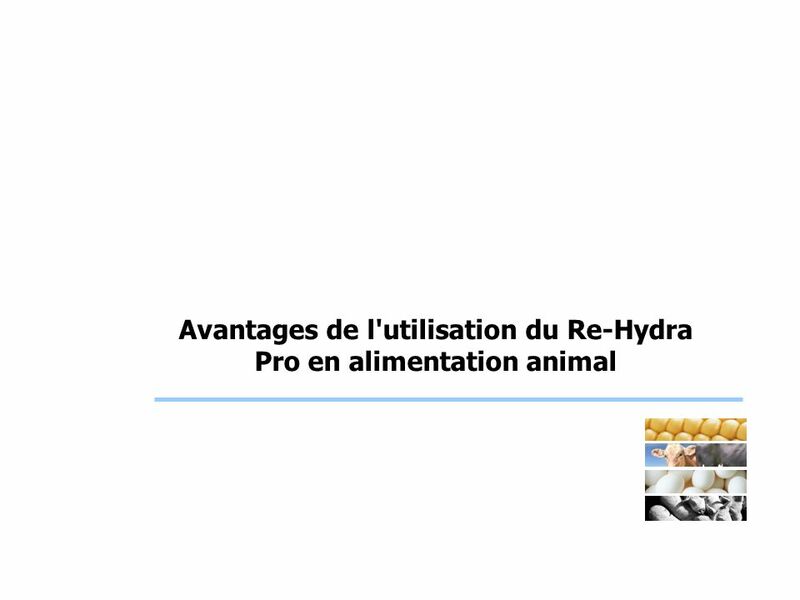 Télécharger ppt "Avantages de l'utilisation du Re-Hydra Pro en alimentation animal"